Truth be told, I am not an ardent fan of the work of designers Denning and Fourcade. 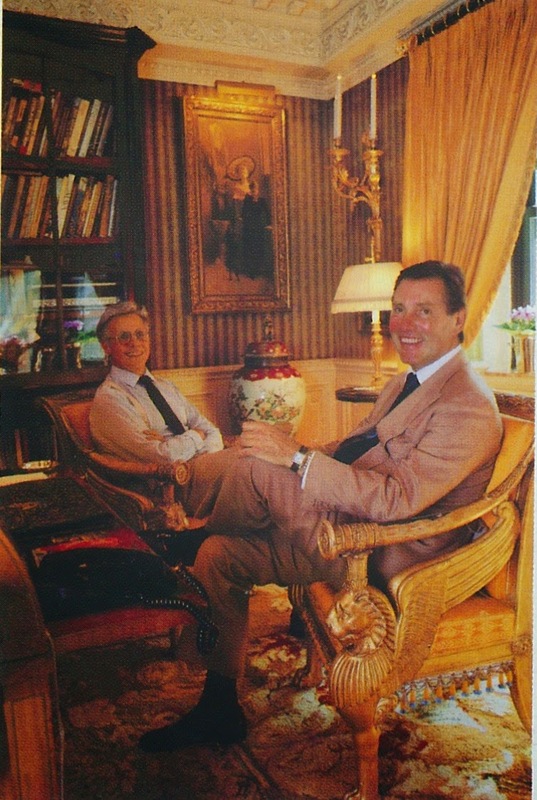 I feel guilty writing that, because Robert Denning and Vincent Fourcade were awfully talented. My hang-up - perhaps mine alone though I suspect not- is that I often find their work to be a little too rich for my taste. 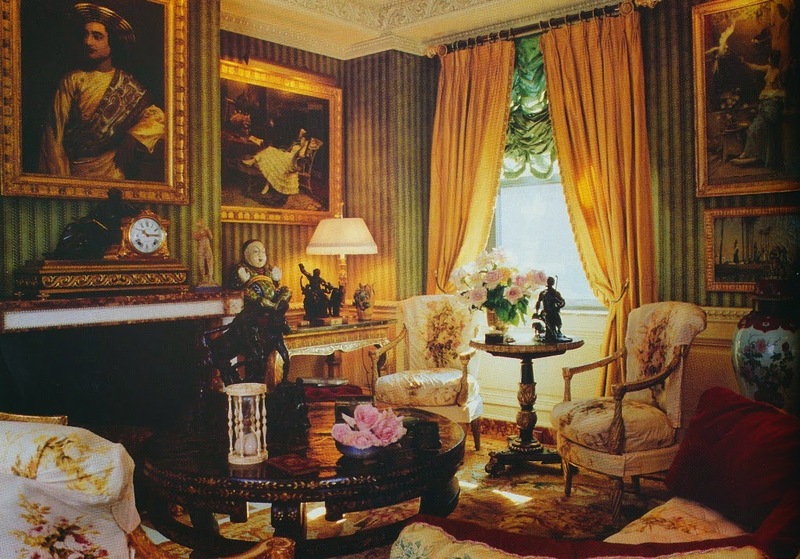 Their lavish use of sumptuous fabrics and grand furniture makes me think of chocolate truffles, in that a little bit goes a long way. That being said, I really do appreciate their body of work, and when I come across photos of a Denning and Fourcade-decorated home, I always stop to look. You can't glance at their work and expect to absorb it quickly. The layers and layers of, well, stuff require close examination. Only then can one see the method that went into their multi-layered approach to decorating. I don't get the impression that they simply threw a lot of furnishings into a room without any forethought. Although that opulent Denning and Fourcade look is quite the opposite of today's style of decorating, there is still much we can learn from it. Their work is a lesson in quality, which is often sadly lacking in today's world. 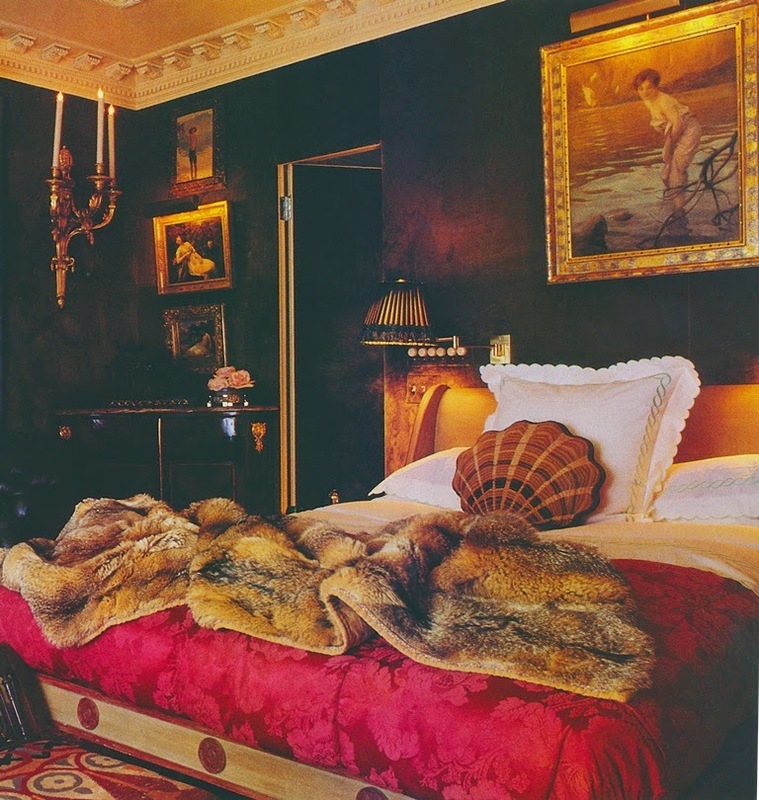 When you look at photos of their work, let your eyes sift through the multitude of furnishings, and what you'll find are impeccable fabrics, excellent antique furniture, and rarefied objects. Now imagine how just one antique rug, for example, or a gilt mantel clock could raise the level of refinement and sophistication in a room of one's own. 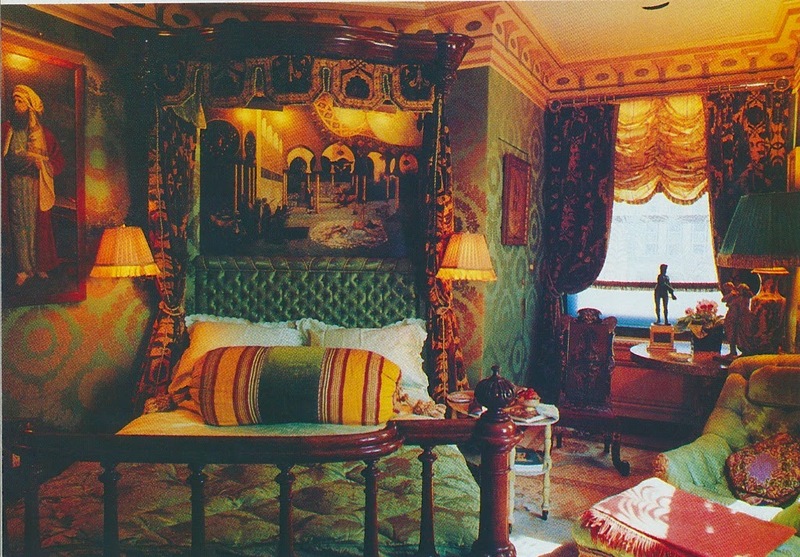 By the way, the photos below show the designers' Manhattan apartment, circa 1990. "Refreshing" may not be the first word to pop into your head while looking at these photos, and yet, I do think it's refreshing to see a home in which elegance, luxury, and comfort coexist so peacefully. All photos from HG, October 1990, Karen Radkai photographer. Hello Jennifer, I see just what you mean. 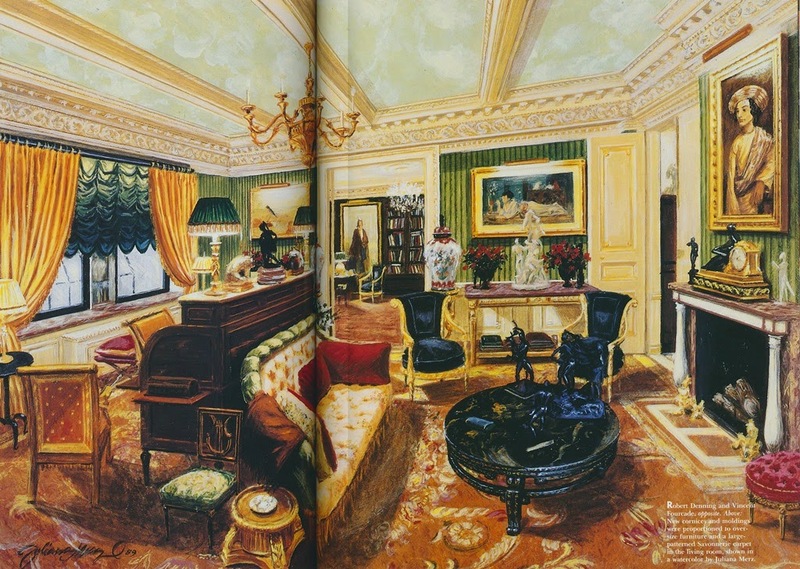 All the beautiful objects and details are masterfully blended, drawing you into each room, but one is still left with somewhat of an 'inside of a jewel-box' feeling. It's a bit over-the-top for me. But I do appreciate the attention to detail and gorgeous antiques. I could envision many of these pieces in a more minimalist setting. Have a great week-end. 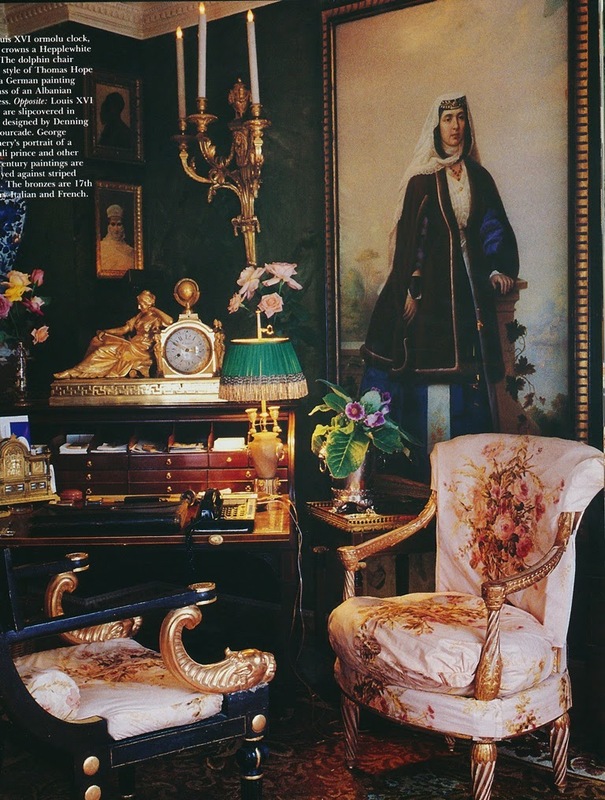 The Denning and Fourcade interiors are indeed sumptuous and opulent. I searched, unsuccessfully, for a book on them and did not find one. I am wondering if you or your readers are aware of any. A pleasing contrast to the all white minimalism that seems to be the required decorating scheme of the moment here in Australia. I really like the shell shaped pillow on the bed.